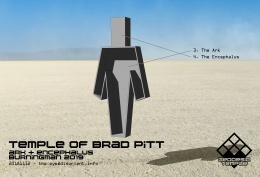 The Temple of Brad Pitt channels the famous Hollywood actor. 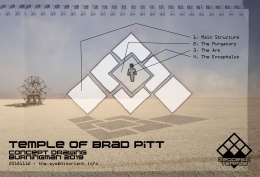 It captures Brad Pitt’s aura, extracts the essence of his being through data gathering and redisplays it as a performative sculpture enabling Burning Man 2019 participants who enter a special apparatus to briefly experience what it is to be him. A 40ft. tall structure made of several identical octahedra. Following Geodesic Temple’s design principles, this structure is the central architectural element of the Temple and visually defines it. The main feature inside TOBRIT, this semi-private chamber serves as preamble and waiting room to the Ark. It can hold a dozen people and is a receptacle for offerings. (Some believe that the grander the offering, the fuller the ensuing bradpittization.) On the walls inside the Purgatory hieroglyphic parables about Brad Pitt and the process of becoming him guide the attentive players through the metamorphoses. 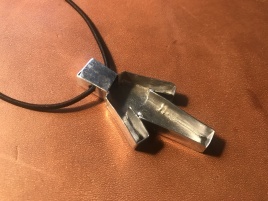 A metal vessel designed to host only one person at a time hovers inside the Purgatory. Entering the Ark is the next step toward becoming Brad Pitt. Although it is possible to experience some level of bradpittization anywhere inside the Temple, players are encouraged to deposit their bodies inside the Ark for best results. Make sure you lift the Veil before positioning yourself inside the Ark. Designed to host the head of the person inside the Ark, this exiguous space is the theatre of the second metamorphosis. It is recommended to stay there about one minute (do not look at your watch). A place to quiet the mind and expand consciousness; to let go and explore the infinite within. 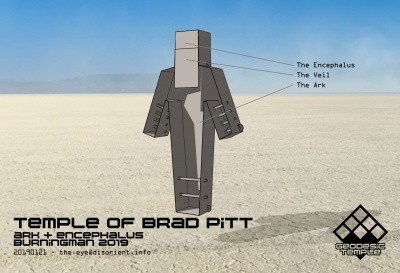 The place for enhanced bradpittization, the Encephalus is where most players will experience the deepest sense of being Brad Pitt. The most sacred space of the Temple. Pro tip: lift the Veil as you enter the Encephalus. 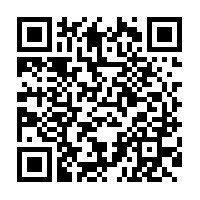 Data gathered from a variety of sources linked to the actor’s life such as, psychological profile, names of characters he portrayed in movies, astrological theme, face recognition parameters, etc. are fed to the AI engine to help determine the physical characteristics of TOBRIT through generative design and a recursive process. TOBRIT's pop reference stands-out in the midst of the overt and increasingly hypocritical "love" culture. We think of it as counter-counter-culture, a revival experiment that doesn't actually lead you back to a place experienced before. Striving for striking subtlety, our color palette only consists of a few white temperatures including Soft White (2700K – 3000K), Bright White/Cool White (3500K – 4100K) and Daylight (5000K – 6500K). Face/emotion recognition, generative design, Encephalus input/output: Nick C.